Recent aging researches reveal that some aging phenotypes are reversible, in fact age related dysfunctions may be classified in an early stage then reversible, and as a later stage with permanent damage. Nicotinamide adenine dinucleotide (NAD+) has been proposed as one of the most important molecules involved in pathways linked with age-related diseases. NAD+ works as a substrate for several enzymes including poly (ADP-ribose) polymerases-1 (PARP-1) and sirtuins (SIRT1-7) which regulate cell survival, DNA repair, oxidative stress, inflammation, and metabolic homeostasis. The positive effect of sirtuins in extending lifespan, through a mechanism that mimics caloric restriction, has been demonstrated in a wide range of organisms. Therefore, understanding biological processes regulating NAD+ synthesis and degradation may be fundamental to further increase our knowledge in process needed to counteract aging. 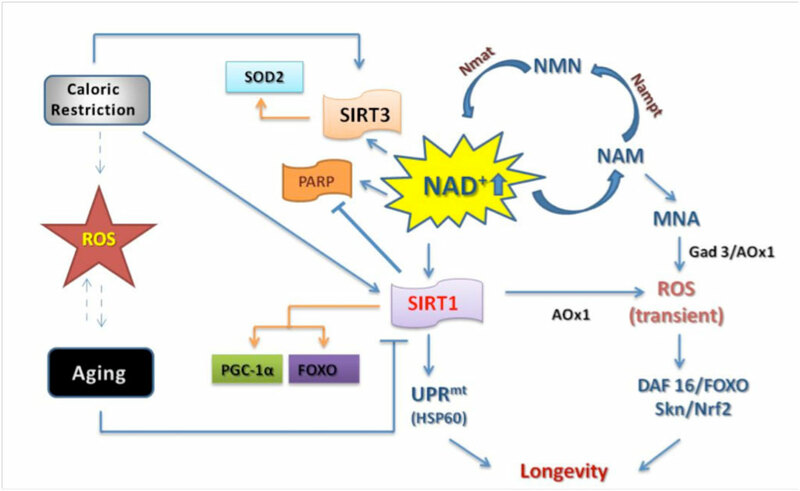 In this review we discuss the role of NAD+ as main substrate for the beneficial effect mediated by sirtuins and PARP and its potential role to develop strategies to prevent aging. Aging research reveals that some aging phenotypes are reversible, in fact age related dysfunctions may be classified in an early reversible stage, and in a later stage with permanent damage (DNA mutations or deletions or cell death) 1. Therefore one of the main challenge of our era is to understand pathways underlay these reversible aging phenotypes with the final goal to identify strategies to prevent age-related diseases and then increase lifespan. Recently nicotinamide adenine dinucleotide (NAD+) has been proposed as one of the most important molecules involved in these age-related pathways 2. NAD+ works as a substrate for several enzymes including poly (ADP-ribose) polymerases-1 (PARP-1) and sirtuins (SIRT1-7) which regulate cell survival, DNA repair, oxidative stress, inflammation, and metabolic homeostasis. Mammal sirtuins are NAD+-dependent deacetylases that use NAD+ as cofactor for catalyzed reactions to cleave acetyl groups from acetylated lysine residues of target proteins, generating nicotinamide (NAM) and 2′-O-acetyl-ADP-ribose. PARP family members are also NAD+-consuming enzymes which degrades NAD + in NAM and O-acetyl ADP ribose by sirtuin mediated deacetylation. Therefore NAD+ is the central substrate for many reactions pivotal to control cellular surviving. NAD+ levels are replenished through the salvage pathway: NAM was converted in nicotamide mononucleotide (NMN) by adenyltransferase (Nampt), while NMN directly synthesizes NAD+ NMN adenyltransferase (Nmnat) (Figure 1) 3. Understanding all biological processes regulating NAD+ synthesis and degradation may be fundamental to understand process that would be worth to investigate to counteract aging. With this final goal, during last decades, several studies were aimed to find strategies to prevent aging. The most recognized common strategy has been focused on caloric restriction (CR) defined as a dietary regimen low in calories without malnutrition. The positive effect of CR in extending lifespan has been demonstrated in a wide range of organisms 4. CR exerts its effect by activating sirtuins 5 , 6. CR increases the expression levels of SIRT1 7, 8, SIRT3 9 and SIRT5 10, while high fat diet has been demonstrate to reduce SIRT1 expression 11. Previously, it has been found that knockout mice lacking both copies of SIRT1 displayed a shorter median lifespan compared with wild-type mice on an ad libitum diet 12. In addition, it has been reported that median lifespan extension in CR heterozygote SIRT1(±) mice was identical (51%) to that observed in wild-type mice, but SIRT1(±) mice displayed a higher frequency of certain pathologies 13 highlighting its important role in age-related diseases. Therefore, activating sirtuins, especially mitochondrial sirtuins, also by increasing availability in cellular NAD+ as suggested by Mendelsohn et al. 14 could be at the present the best strategy to extend lifespan mimicking CR effects. Among different compounds, resveratrol (a natural poliphenol) so far has been demonstrated not only able to improve lifespan, but also able to ameliorate diseases related to aging by activating sirtuins 15 , 16. The main theory on the aging is based on the unbalance between the presence of exogenous and endogenous noxious stimuli and the body defensive mechanisms. A main concept of aging is the increase in oxidative stress coupled with a lower antioxidant defense. A new concept in the susceptibility of aging processes in the role of inflammation indicated as central mechanisms of each tissue injuries. A new terms called “inflammaging” has been developed to highlight these relationship. Reactive oxygen species (ROS) induce cellular damages at different levels (proteins, DNA, and lipids) which increase the body susceptibility to noxious injuries with the final result to accelerate aging and decrease lifespan. Sirtuins can modulate cell responses to ROS by mimicking CR conditions. SIRT1 deacetylation by the NAD+ salvage pathway may regulate the cellular redox system, the energetic process underlay ROS production. NAM has been demonstrated to inhibit sirtuin deacetylase activity by a negative feedback. To maintain sirtuin function therefore it is necessary to replenish NAD+ levels through nicotinic acid or nicotamide biosynthesis pathways. For instance, in the case that nicotinic acid or nicotamide are deficient in the cell, NAD+ is synthesized from alternative pathways such as L-tryptophan cycle. Interesting, Schmeisser et al. have recently demonstrated that not only NAM can restored NAD+ but also a methylated form of NAM, 1-methylnicotamide (MNA) (Figure 1). Figure 1. NAD+ metabolism. Increase in NAD+ availability by PARP inhibition or NAM supplementation can extend lifespan. In fact NAD+ metabolism activates mitochondrial unfolded protein (UPRmt ) and transient ROS production. Transient ROS production induces antioxidant defense either by DAF16/FOXO or Skn/Nrf2 signaling ultimately improving longevity. Conversely ROS, aging and caloric restriction interact to influence sirtuins activities, particularly SIRT1 and SIRT3. Upon stimulation SIRT1 and SIRT3 deacetylate by using NAD+ different proteins involved in antioxidant response. Arrows indicate positive regulation while hash-marks indicate negative regulation; dashed lines indicate putative interaction. This form may induce extension lifespan mediated by sirtuin activity in deacetylation-indipendent manner. MNA is able to generate ROS in transient manner which inducing antioxidant mechanisms in a preconditioning fashion depending on SKN-1/NRF2 and FOXO /DAF16 activation pathways 17. Another recent work by Moichiroud et al., demonstrates as PARP chemical inhibition in mammalian cells increases NAD+ levels 18 and improves lifespan. The increased availability of NAD+ activates mitochondrial unfolded protein response 19. Therefore, mammalian cell line lifespan was extended by following pathway NAD+/SIRT1/UPRmt/SOD 20. The response to damage induced by ROS is mediated by SIRT1 in the nuclear while in the mitochondria is mediated by SIRT3. Among several protective pathways, SIRT1 activates FOXO which promotes SOD2 gene expression able to neutralize ROS 21. In addition to prevent ROS mediated damages SIRT1 promotes mitochondrial biogenesis by activating peroxisome proliferator-activated receptor coactivator-1α (PGC-1α) which upregulates glutathione peroxidase (GPx1), catalase, and manganese SOD (MnSOD) 22. On the other hand ROS damages are counteracted in the mitochondria by SIRT3 activation that improve SOD2 activity during CR 23. Based on the previous evidences, it rusults important to maintain cellular NAD+ availability especially in mitochondria when stresses induce a major consumption of NAD+ and ATP and prone the organism more susceptible to ROS damages. 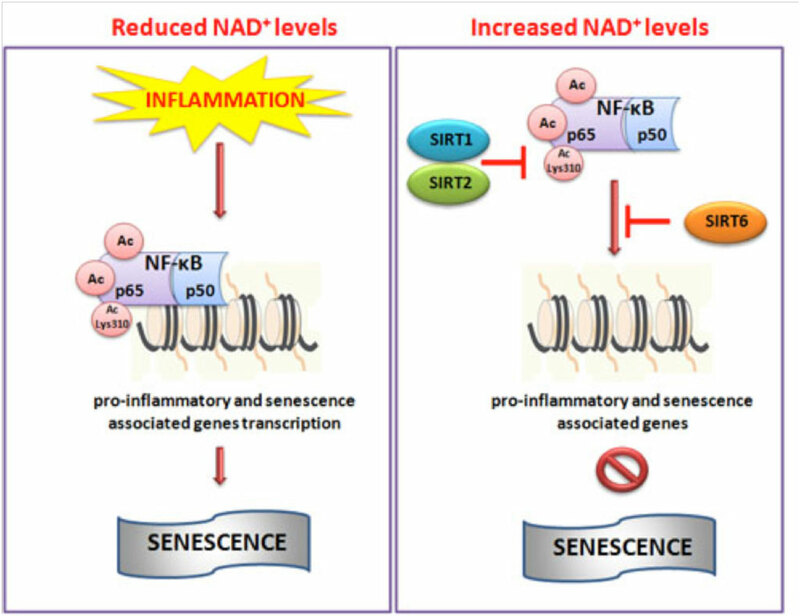 NAD+ activity is important not only for lifespan and oxidative stress, but is crucial also to counteract aged related inflammation processes. A key transcription factor involved in expression of pro-inflammatory cytokines and senescence is Nuclear factor-kB (NF-kB) 24. NF-kB/p65 subunit DNA-interaction increase with increase of age in several tissues suggesting as NF-kB inhibition may prevent aging and its related diseases 25. NAD+, by modulating NF-kB transcriptional activity has been shown to reduce the inflammatory state 26. Han et al. demonstrated that in Caco2 cells, extracellular NAD+ inhibited the binding of NF-kB to DNA by blocking the transcription of different genes involved in both inflammatory and aging pathways (interlukin-6, interlukin-1 beta, tumor necrosis factor alpha) 27. Anti-inflammatory properties were found for almost each sirtuin. In particular, it has been demonstrated that SIRT1 and 2 are able to inhibit NF-kB by directly interacting with its p65 subunit and deacetylating specifically the lysine 310, a crucial residue for its activation 28 , 29 , 30. In line with this results, hyperacetylation of NF-kB and decrease in SIRT1 activity was found in High Fat Diet (HFD)-induced pro-inflammatory cytokines 31. While SIRT1 and 2 inhibit NF-kB through posttranslational modification, SIRT6 neutralizes it by decreasing the accessibility of p65 subunit on promoter region of NF-kB target genes 32. In SIRT6 knockout mice, which exhibit accelerated aging phenotype, haploinsufficiency of p65 subunit of NF-kB resulted in improved lifespan 33. In studies conducted in SIRT1 deficient macrophages was observed a compensatory effect of SIRT6. In fact, it was found an association of SIRT6 in some promoter region of NF-kB targeted gene after TNF-alpha stimulation 34. It is, therefore, obvious the important role of NAD+,as substrate of all reactions mediated by SIRT1 and SIRT6, in increasing lifespan by reducing NF-kB-mediated inflammation (Figure 2). Figure 2. Schematic illustration of NAD+-mediated sirtuins actions on NF-κB. 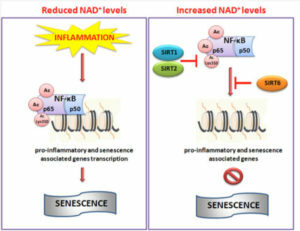 During inflammation reduced levels of NAD+ do not impaired the hyperacetylation of NF-κB which in turn through promoter region of target genes activate pro-inflammatory pathway and senescence. Conversely, increased cellular levels of NAD+ activate SIRT1, 2 and 6 which deacetylate NF-κB inhibiting its transcriptional role and then inflammation. Three main pathways has been demonstrated so far to control lifespan in mammals involving: insulin/insulin like growth factor1 (IGF1), tuberous sclerosis complex (TSC)/mammalian target of rapamycin (mTOR), and sirtuins. These pathways control the response to injuries and cellular stress, such as DNA damage, hypoxia and cellular transformation 35. Different drugs have proposed to modulate these pathways and retard aging such as SIRT1 activators 36. Resveratrol is a phytoalexin found in the skin and seeds of grapes. It was the first chemical activator of SIRT1 which mimics beneficial effects of CR 37. Recent studies have proposed as resveratrol may counteract aging by mechanism independent of the direct allosteric SIRT1 activation, such as inhibiting cAMP phosphodiesterases, elevating cAMP levels and indirectly increase in NAD+ which finally leads to increase in SIRT1 activity 38. Other polyphenols such as butein, quercetin, piceatannol, and myrcetin have been proposed as anti-aging compounds. However, their ability to activate SIRT1 especially in oxidative stress conditions have been demonstrated to be limited. Other drugs may indirectly increase SIRT1 activity by increasing in NAD+ production: Sulphorane, an activator of Nrf2, and Thiazolidinediones via Nampt secretion 39. NAD+ level is essential for reactions catalyzed by sirtuins and PARP activity, therefore by increasing its endogenous levels allow a more powerful effect against age-related diseases and in increasing lifespan. Another strategy may be utilize NAD+ precursors, or blocking its consumption by poly(ADP-ribose) polymerase (PARP) enzymes to reach the same benefic effect especially in subject with high predisposition to age related disease 40. Mendelsohn AR, Larrick JW. Rejuvenation of aging hearts. Rejuvenation Res 2013; 16: 330-332. Sohal RS, Weindruch R. Oxidative stress, caloric restriction, and aging. Science 1996; 273: 59-63. Revollo JR, Grimm AA, Imai S. The regulation of nicotinamide adenine dinucleotide biosynthesis by Nampt/PBEF/visfatin in mammals. Curr Opin Gastroenterol 2007; 23: 164-170. Schmeisser K, Mansfeld J, Kuhlow D, Weimer S, Priebe S, Heiland I, Birringer M, et al. Role of sirtuins in lifespan regulation is linked to methylation of nicotinamide. Nat Chem Biol 2013; 9: 693-700. Bai P, Canto C, Oudart H, Brunyanszki A, Cen Y, Thomas C, Yamamoto H, et al. PARP-1 inhibition increases mitochondrial metabolism through SIRT1 activation. Cell Metab 2011; 13: 461-468. UPRmt) leading to increase in SOD expression and activation ((Merksamer PI, Liu Y, He W, Hirschey MD, Chen D, Verdin E. The sirtuins, oxidative stress and aging: an emerging link. Aging (Albany NY) 2013; 5: 144-150. Mouchiroud L, Houtkooper RH, Moullan N, Katsyuba E, Ryu D, Canto C, Mottis A, et al. The NAD(+)/Sirtuin Pathway Modulates Longevity through Activation of Mitochondrial UPR and FOXO Signaling. Cell 2013; 154: 430-441. Brunet A, Sweeney LB, Sturgill JF, Chua KF, Greer PL, Lin Y, Tran H, et al. Stress-dependent regulation of FOXO transcription factors by the SIRT1 deacetylase. Science 2004; 303: 2011-2015. Rodgers JT, Lerin C, Haas W, Gygi SP, Spiegelman BM, Puigserver P. Nutrient control of glucose homeostasis through a complex of PGC-1alpha and SIRT1. Nature 2005; 434: 113-118. Someya S, Yu W, Hallows WC, Xu J, Vann JM, Leeuwenburgh C, Tanokura M, et al. Sirt3 mediates reduction of oxidative damage and prevention of age-related hearing loss under caloric restriction. Cell 2010; 143: 802-812. Harrison DE, Strong R, Sharp ZD, Nelson JF, Astle CM, Flurkey K, Nadon NL, et al. Rapamycin fed late in life extends lifespan in genetically heterogeneous mice. Nature 2009; 460: 392-395. Della-Morte D, Ricordi C, Rundek T. The fountain of youth: role of sirtuins in aging and regenerative medicine. Regen Med 2013; 8: 681-683. Della-Morte D, Dave KR, DeFazio RA, Bao YC, Raval AP, Perez-Pinzon MA. Resveratrol pretreatment protects rat brain from cerebral ischemic damage via a sirtuin 1-uncoupling protein 2 pathway. Neuroscience 2009; 159: 993-1002. Park SJ, Ahmad F, Philp A, Baar K, Williams T, Luo H, Ke H, et al. Resveratrol ameliorates aging-related metabolic phenotypes by inhibiting cAMP phosphodiesterases. Cell 2012; 148: 421-433. Haider DG, Mittermayer F, Schaller G, Artwohl M, Baumgartner-Parzer SM, Prager G, Roden M, et al. Free fatty acids normalize a rosiglitazone-induced visfatin release. Am J Physiol Endocrinol Metab 2006; 291: E885-890. Della-Morte D, Ricordi C, Guadagni F, Rundek T. Measurement of subclinical carotid atherosclerosis may help in predicting risk for stroke in patients with diabetes. Metab Brain Dis 2013; 28: 337-339.